Crate training for puppies is long due for an overhaul. 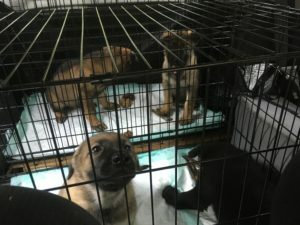 For too long a puppy’s first exposure to the crate was being locked inside, left to panic, and then being “taught” to be crated by being ignored until it ceased crying. 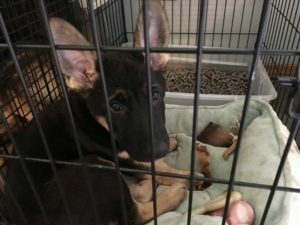 Too long has the crate training standard been not to gradually acclimate puppies to confinement, but instead to induce learned helplessness when confined by ignoring the puppies vocalizations. Then we wonder why so many grown dogs exhibit behaviors associated with barrier frustration/aggression, separation distress/anxiety, and a myriad of other confinement specific undesirable behaviors later in life. New puppy owners often felt overwhelmed by the crying, puppies already sensitive to stress while transitioning to a new home were stressed further, potentially triggering separation distress, and a myriad of other potential undesirable outcomes become more likely. There is a better way. 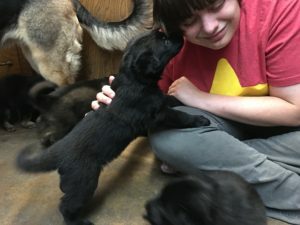 Instead of forcing puppies to give up complaining about confinement, we can condition them to be confident craters, and it’s not difficult either. Rose is confident and content being crated in my vehicle, even though there are other dogs and people walking around. If you’re a breeder or foster who cares for puppies from birth please use our Crate Conditioning For Puppies: An Incremental Approach. 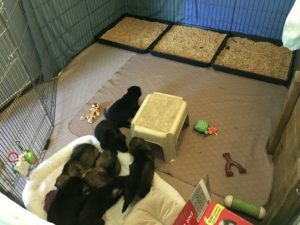 If you are bringing home a new puppy (from a breeder, shelter, or rescue) who has never been exposed to a crate, or who may have had unpleasant associations with confinement, you may also start with Crate Conditioning For Puppies: An Incremental Approach as your foundation crate work. 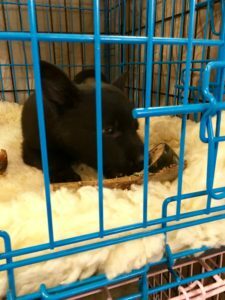 If you are fortunate enough to be bringing home a puppy from a Puppy Culture breeder, or a breeder who has used our (or a similar) crate conditioning protocol, you can easily continue that work by following these principles. Leading Principle: Crates are where good things happen. During crate conditioning, have the crate bed be the only bed. We want our puppy to prefer to rest inside the crate, so make resting in the crate desirable with a good bed. It’s a very good idea to have both a smaller night time crate in the bedroom, and a larger daytime crate in the living area. 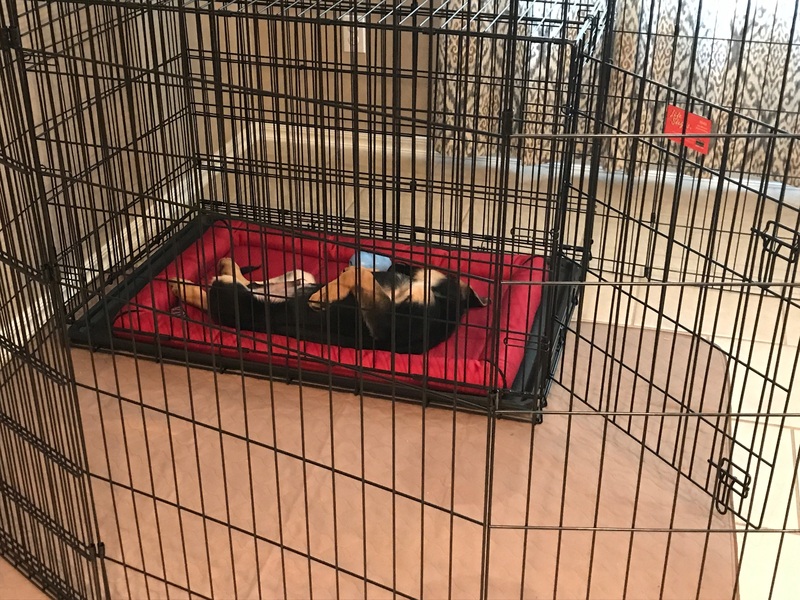 When your puppy falls asleep, gently pick it up and place it in it’s daytime crate to nap. Do this every time you find your puppy asleep outside it’s crate. Close the door if you will be nearby to release the puppy when it awakens, or place an x pen around the crate. 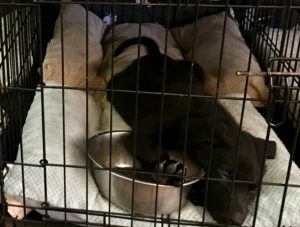 Feed your puppy in it’s crate if it’s eating from a bowl. 4. Gradually teach your puppy to expect a few minutes of confinement after each meal. 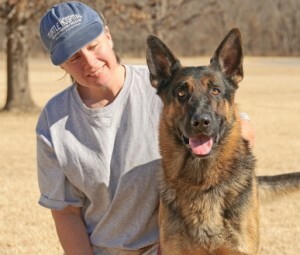 Large breed dogs, such as my German Shepherds, benefit from rest after eating. 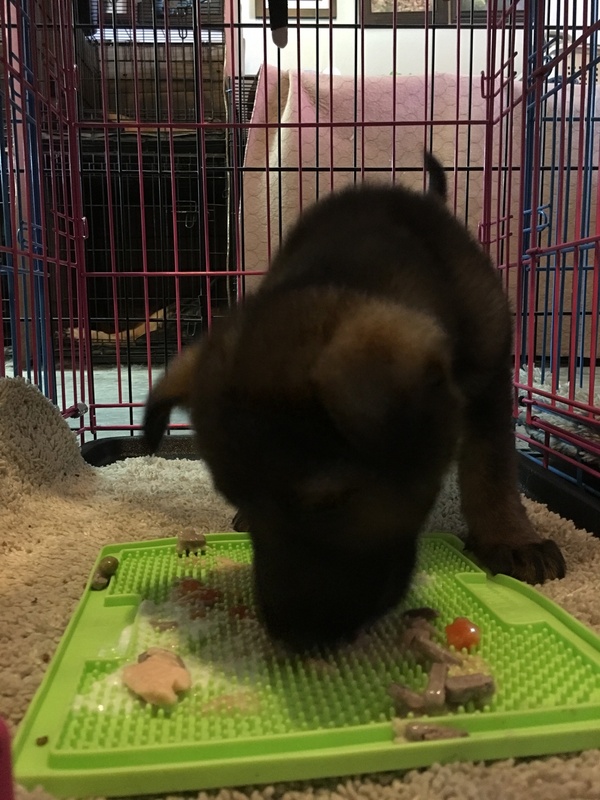 Teaching your puppy to expect to rest in the crate after eating also means you can feed your puppy right before the humans eat, and you can enjoy a “dog free” dinner time. Always provide puppies with a high value chew after eating, to help them relax and pacify themselves. 5. Provide daily “chewing” sessions in the crate. Dogs love to chew, and puppies especially require chewing. The crate is the perfect place to provide this activity. 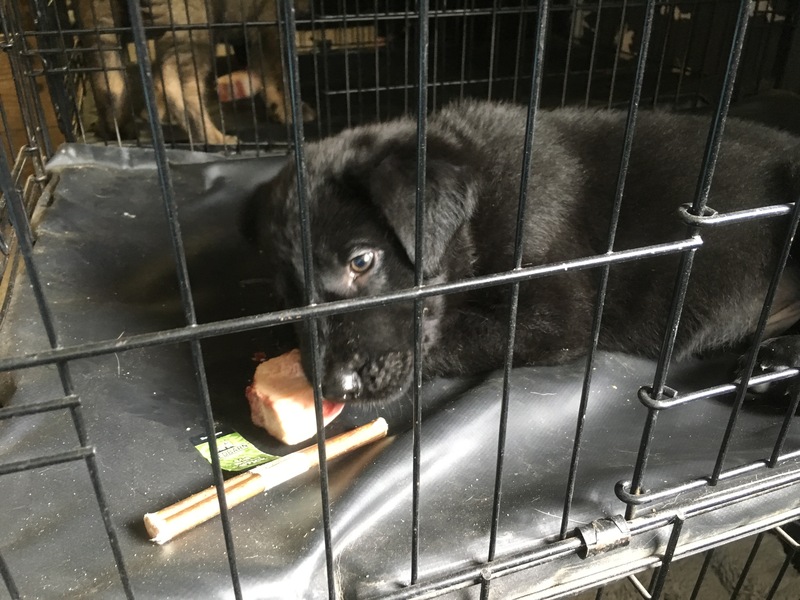 When you can’t directly supervise your puppy or when your puppy is due for a nap, pull out a pacifier and put your puppy in it’s crate for a chew session. 6. Be prepared to pair all duration crating sessions with high value chews for the first few weeks. Collect as many types of chews as you can, stuff them them yummy things if they are stuffable, and provide them only in the crate. You find find more ideas and inspiration in my blog, The Power of a Pacifier. 7. Crate your puppy at night, but not alone. Puppies are sensitive to separation and will vocalize when they feel isolated. This is very strong survival instinct that has it’s roots in the dog’s evolution, long before it was a pet. Here are some suggestions to bypass separation distress. At night, crate your puppy on your bed, or place the crate at bed height right next to your bed. Your breathing and movement will help sooth a puppy and prevent it from feeling “lost” and alone. Provide a large stuffed animal, or Snuggle Buddy, for the puppy to cuddle with at night. 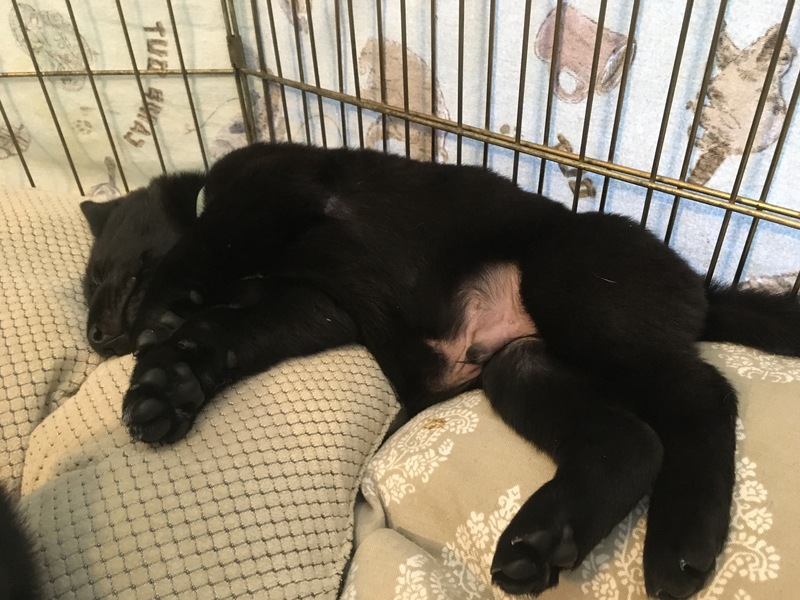 For every night your puppy sleeps at least 6 hours without waking, you can move the crate 1 foot away from your bed until you reach the area of the bedroom where you would like your bedtime crate to be located. Put a tired puppy to bed with the last person to retire for the night. Feed dinner at least 3 hours before bedtime, and take water up 1 hour before bedtime. Calmly walk the puppy for at least 10 minutes before putting it to bed. If your puppy is fussing at night, offer it a chance to potty. Keep nighttime potty breaks “businesslike.” Simply carry the puppy out, clip the leash on, and stand in one place for no more than 3 minutes while the puppy relieves itself. Do not talk, play or feed your puppy. Doing these things distract from the purpose of the potty break and can teach your puppy to wake you up for play and treats. Be consistent in the nighttime pottybreak protocol. You want your puppy to learn to “ask out” if it needs to void in the night (otherwise, it may learn to void in the crate) but you don’t want to teach your puppy that waking you up has ANY purpose other than going to the potty. When 3 minutes is up, carry the puppy back to it’s crate on your bed, place it inside, close the door and turn out the lights and go back to sleep. Repeat EVERY time your puppy vocalizes in the night crate, your puppy will learn to ask out only to potty during the night. This process may take a week, so be prepared. Do not offer chews or pacifiers in the Night Crate. Nighttime is for sleeping, and sleepy puppies need to sleep. Soothing music, scents (such as Adaptal)and a cool room will help puppies sleep. 8. Devise a routine and stick with it. Puppies love routine because it’s comforting to know what to expect. Find a routine that includes crate conditioning time. Good examples are to crate your puppy after each meal, at human mealtimes, and the first 10 to 15 minutes after visitors arrive. Be sure to pair a high value chew with each duration session! Use the same routine when you leave the house – pair this with a high value chew and soothing sounds and scents. 9. Provide high value pacifiers for car crate time too! 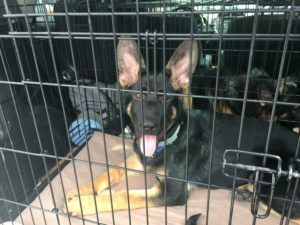 Be sure to take the time to condition your dog to traveling in a crate. Not only can this prevent barrier aggressive behaviors from starting, but it’s safer for the dog and driver. Pair all car crate rides with high value chews at first. 10. Practice Crating on outings. If you plan to travel or compete with your dog, it’s worth it to condition your dog to enjoy crating anywhere. Purchase a “tent” or cloth crate that’s easy to carry and take it to training classes with you. Crate your puppy (with a pacifier) during class down time when your instructor is teaching or other dogs are working. If your instructor includes mat training (yay!) place your mat inside your tent crate to do some of your mat work. Some common and not so common sense tips. Don’t crate your puppy too much. It’s unhealthy for their body and mind – a crated puppy isn’t being socialized or learning any life skills. 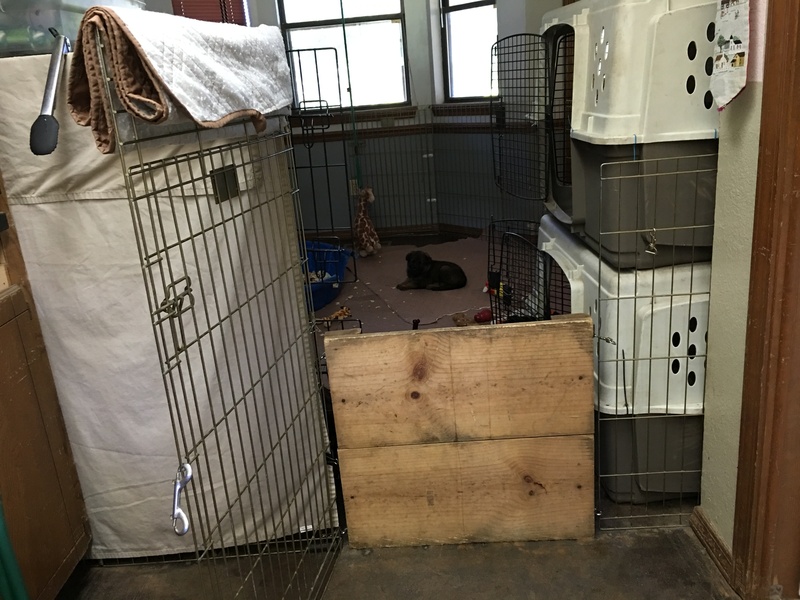 Yes, puppies need crate time every day, but they do not benefit from being confined too often. Play lots of crate entry games! Have someone hold the puppy while you run and put it’s food bowl inside the crate. Next, call the puppy with your crate entry cue – this is also your helper’s cue to release the puppy! Cheer the puppy while it’s running to the crate and praise while the puppy enjoys it’s meal. Play lots of these types of games. “Bait” your crate ahead of time. 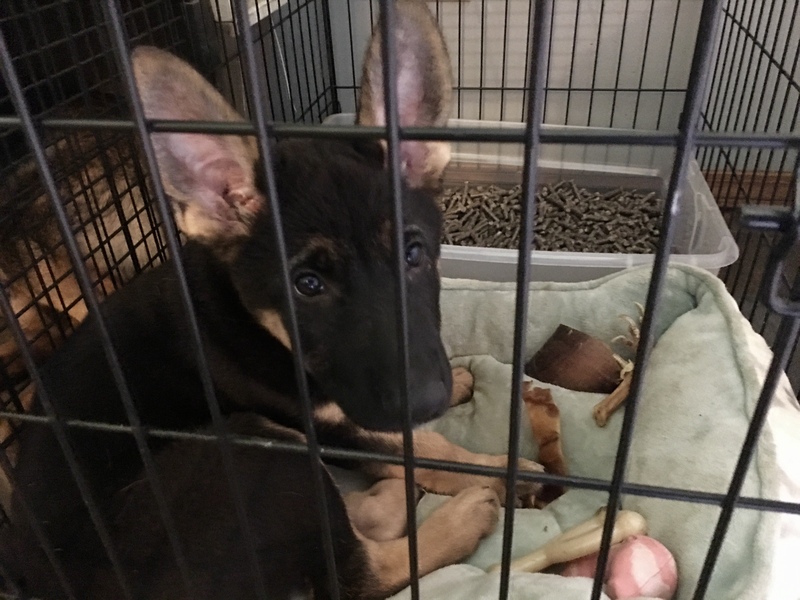 If you put your puppy’s chew in the crate and close the door, the puppy will REALLY want to enter the crate! 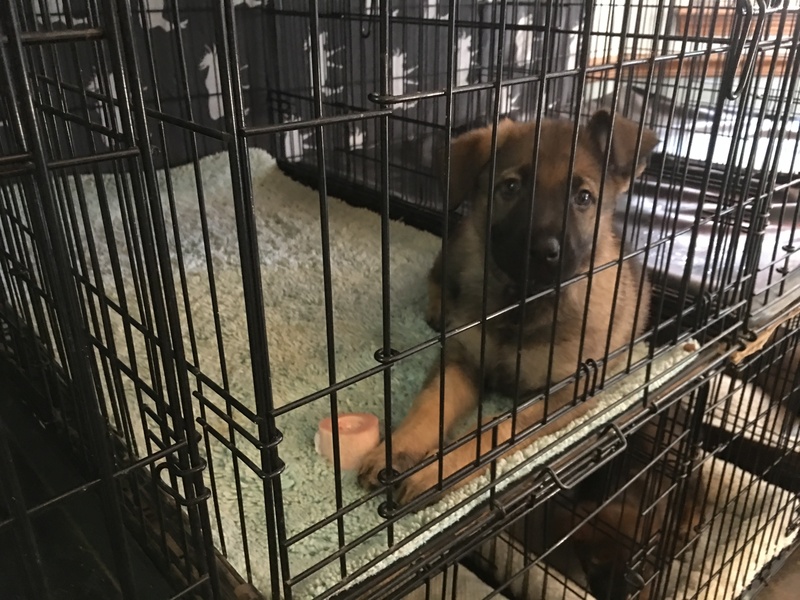 Plan ahead and bait the crate with your chosen pacifier 10 to 30 minutes ahead of scheduled crate times, then call your puppy to crate up with your crate entry cue, open the door, and voila…your puppy loves to run into the crate! Don’t bribe your puppy to enter the crate. If your puppy is reluctant to enter the crate, do more of number 2 and 3, but avoid at all costs bribing your puppy to enter the crate. This will backfire! 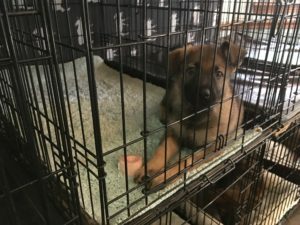 It’s actually better to pick your puppy up and place it inside the crate than to bribe it to enter the crate. If you puppy is reluctant to enter the crate figure out why and fix the problem! Don’t be tempted to bribe or trick the puppy to enter the crate, that will backfire! Consult with a skilled positive reinforcement trainer if needed. 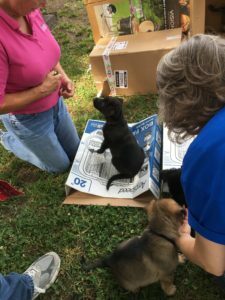 Do you need help crate training your puppy? Or are you a breeder who wants help building a crate conditioning plan into your puppy raising protocols? Distance coaching is available and we are very happy to help, contact us to find out more! Transitions are a part of every dogs life, how can we use a puppy’s transition to it’s new home to teach a puppy to anticipate transitions as positive experiences, and face change with adaptability. Long before this day, a breeder has been working towards an easy transition to the new home. Most breeders, and many new puppy owners, have experienced fall out from a rocky transition. Like the proverbial snow ball growing larger as it rolls down snow covered hill, if a puppy becomes distressed during transition a cascade of undesirable effects can accumulate. Sadly, these can result in an overwhelmed family returning the puppy to the breeder, or an overwhelmed puppy experiencing potentially life altering anxieties, fears, illnesses, or traumas. 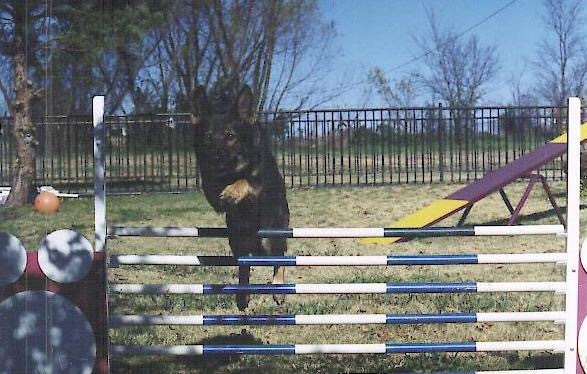 Many of you know the story of my own dog Indeigh, my second German Shepherd puppy and one of the most cherished dogs of my life. 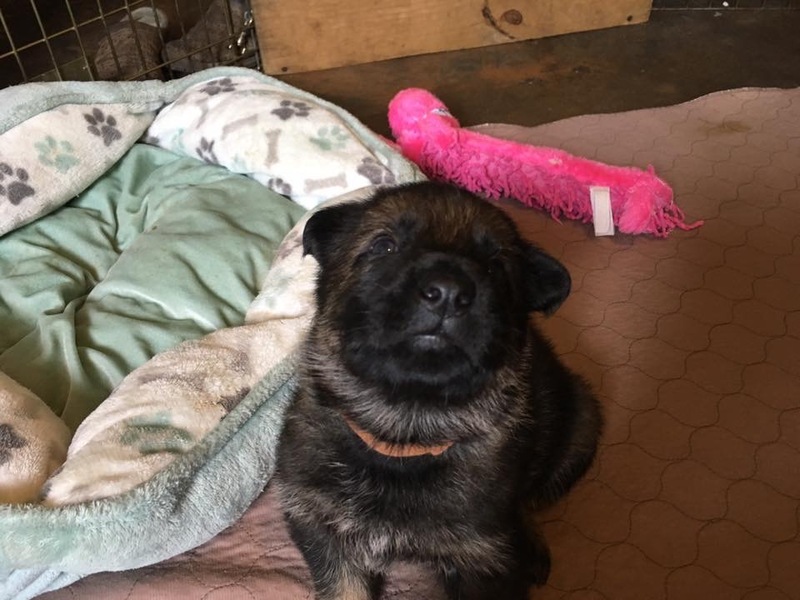 But Indeigh had a rocky start, not knowing how to help this puppy, who was so unprepared for transitioning into my home, had far reaching effects for her. The weeks that snowballed into months, of distress, upset, and frustration we both experienced taught Indeigh to view change and novelty with suspicion and even anxiety. This became a lifelong struggle for this highly acomplished dog. I don’t blame Indeigh, or myself, or her breeder, none of us knew how to prepare or help her. But things have changed in the world of dogs, and animal behavior in general, and as said so famously by Maya Angelou “when you know better, you do better”. Now I know and I want to share what I’ve learned in the nearly 30 years since I brought Indeigh home. SG1 (JHKL) Indeigh v. Spezialblut Bh AD HIC CGC SchH1 Kkl1 OFA. My heart. Indeigh, once again, this is for you. I miss you, and I’m doing better. What can we do to foster resilience in transition? 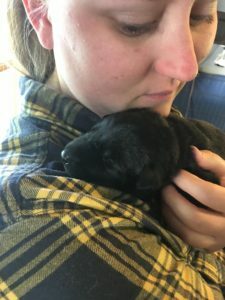 How can we, as breeders, leverage things we already do to help optimize our puppy’s native born temperament? 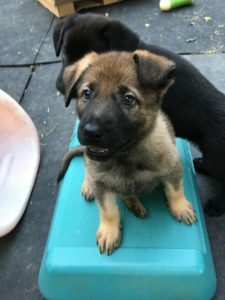 How can we make the most of this first big life transition, using it to create a foundation of adaptability and confidence in our puppy, making the most of each inherited trait. You might think of this as coddling, puppies need stress you would say, to grow into adaptable dogs. You would be right, stress is vital and important to both mental and physical development and growth, however distress is not. Distress creates room for unintended learning, distress doesn’t foster strength and resilience, distress is to be avoided. We don’t want to protect puppies from stress or stressful events, but instead to give them the skills they need to emerge from those inevitable life events stronger, resilient, adaptable, and confident. Adaptability and resilience grow from experiencing small, age appropriate, amounts of stress as positive experiences. That’s the experience we want to foster, it’s the growth medium for confidence. 1. Puppy will learn to anticipate transitions and change as positive experiences that lead to good things. Puppy will feel competent in new experiences. 2. 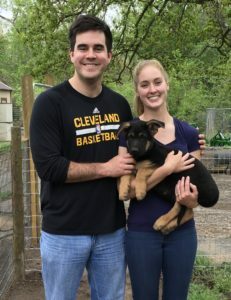 Family will learn how to teach their puppy that transitions are positive experiences using primary reinforcements (social interaction, food, play), and conditioned reinforcers (clickers and other markers) primarily through operant conditioning. We already have the tools we need, we are already working hard, when we look forward to plan life’s first big transition we increase the chance of a smooth transition week for our puppy and the new family, and orchastrate an environment to guide our puppy along a path to adaptability and competence throughout life. 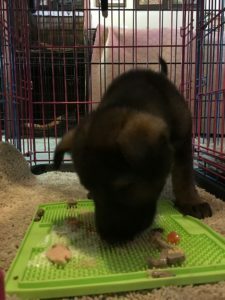 Using the puppy raising protocols from the film Puppy Culture as our guide, here is a list of 5 tips and techniques I, and other breeders, use to optimize puppy’s transition to it’s new home. I hope you enjoy this list and find it helpful! 1. Create a lover of Novelty. 3. Turtle Puppy: I take my home with me. 4. Schedule Choas And Learn To Love The Unexpected. 5. A bridge over changing waters. Let us know what tips you’ve discovered help build confidence in transitions in your puppies, and how you help your new puppy owners make the best of the transition period! Like “a bridge over troubled waters” bridge behaviors help puppies find confidence through communication with their new family, and in a new environment. Unlike a verbal marker which can sound different from person to person, a clicker sounds the same no matter who clicks it. Using the beauty of operant conditioning to create confidence and adaptability to transitions. I’ve saved the most important for last because it’s really just THAT important. What is a bridge? For our purposes here, a bridge is a behavior taught in such a way that a positive emotional response is PART of the behavior. A bridge doesn’t work if it’s a behavior the puppy learned through fear or distress, we want our bridges to help us reach our goal of a dog who thrives under stress, and who enjoys life’s transitions. Since the emotion the puppy experiences when it learns a behavior becomes attached to that behavior, we do not want any unpleasant emotion to travel on our bridge. Learning to sit on a platform, the happy anticipation this puppy feels learning this behavior will be forever attached, she’ll feel happy when cued to sit later in her new home. The magic of the bridge is in the communication between the puppy and the new owner. When puppies leave our home they also leave behind all those contextual cues that help them know what is expected when, and what behavior might be expected of them in particular settings. All those nice clear paths to reinforcement are obscured. They feel a bit like “strangers in a strange land” in the new home. The new family often feels the same way, just how do they get the puppy to do the things they need? Our bridge behaviors give the puppy a way to communicate to the owner and the owner to the puppy. There is empowerment and confidence in this shared language. We encourage our new families to start the day they bring their puppy home with the Puppy Culture Communication Trinity, and to run through these lessons in order. Running through these familiar lessons helps the puppy feel confident and competent in the new home from day 1. So our bridge behavior MUST include a positive emotional response, since we are Puppy Culture breeders and clicker trainers this is easy for us, as all our Puppy Culture Active Enrichment Behaviors and our other clicker trained behaviors fit this requirement. Here are the bridge behaviors our puppies are taught before they go home. 1. Sit (Mand) for things you want. Learning to Mand for a novel person at our Puppy Party. Puppy offers Attention when on an outing to a new and strange environment (a local garden center). Puppy responds to gentle leash pressure by turning to face me, and offering attention. 4. Hand Target (touch your nose to my hand). Puppy learning to hand target with a novel person at a Puppy Party. With this small set of baby behaviors our puppy can, when unsure what to do, be quickly and easily Clicked and Treated for any one of these behaviors. All of these behaviors are very useful for our new families too. Of course, we also need to teach our new families the basics of clicker training, and most importantly when and how to use the bridge behaviors. Much of this is covered in the Puppy Culture film that we provide to each family before their puppy goes home with them. Here are some examples of using bridge behaviors during transition week. 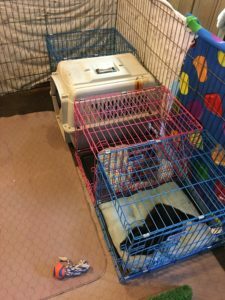 Puppy can Mand to leave crate. Puppy can Mand for meals. Puppy can have the clicker powered up. Puppy can Mand for toy toss. Puppy can give attention for tugging. Puppy can Mand for petting. Puppy can play The Box Game. Puppy can practice Leash Walking. Puppy can give Attention for toy toss. Puppy can Mand for social interaction. 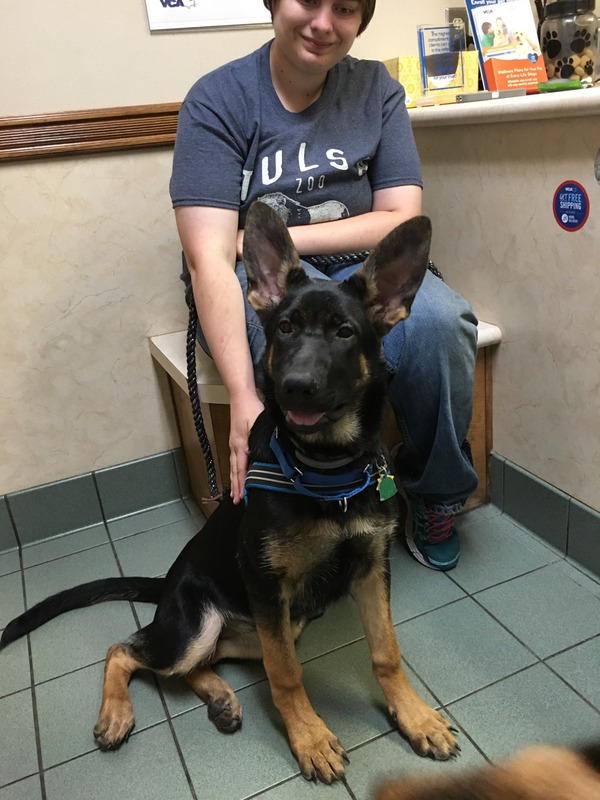 Puppy can play Attention while vet listens to heart. Puppy can follow a Hand Target onto scale. Puppies Manding at their first vet visit. Attention is a powerful bridge behavior! Because we have already conditioned these bridge behaviors, AND taught the puppy owner how to teach, use, and reinforce them, the puppy can experience these situations (all of which are transitions) as fun and reinforcing events because the puppy “knows” how to earn reinforcement in the form of praise, food, and play. 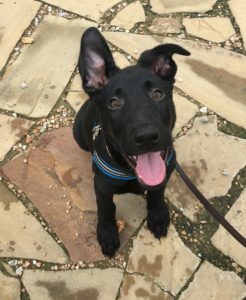 This helps our puppy learn from the very start that it has control over what happens to it, that good things are plentiful and easy to access, and that change predicts these wonderful things. Puppies who are unsure can express a variety of behaviors that we don’t want the puppy to learn or practice. Puppies can be frantic, hectic, nervous, avoidant, and a laundry list of other emotional states and behaviors best never learned. 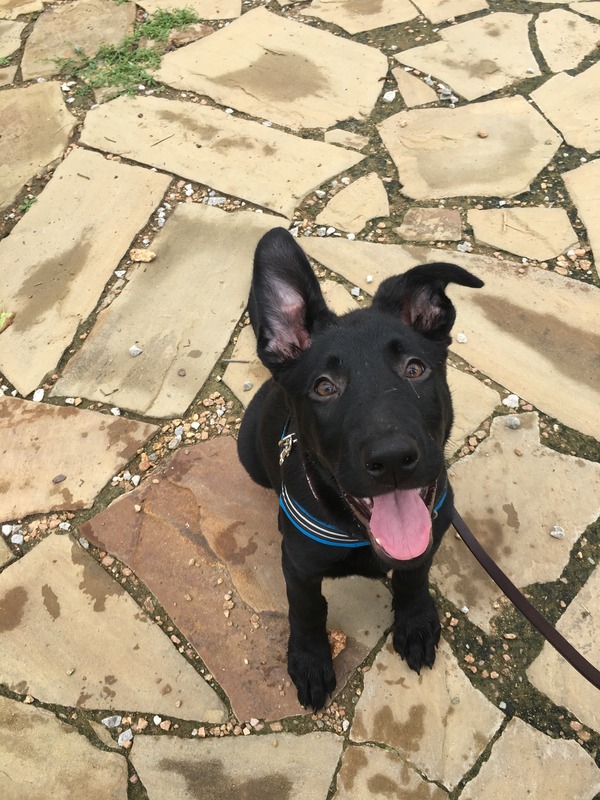 With a small set of bridge behaviors our new puppy owner can ask for desirable behaviors, and our puppy can respond quickly and happily, finding a desirable path to reinforcement that serves it well throughout life. 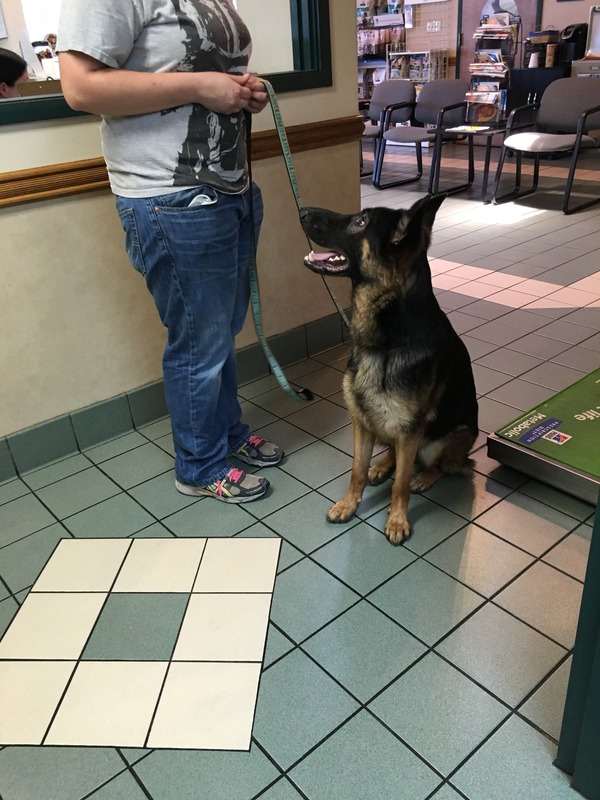 Even as an adolescent, Rose still Mands at the vet’s office! Manding carries through to adulthood, as Zora shows us on a recent vet visit. Schedule or no schedule? Which is better and can it be both? Breeders are often divided, even when they don’t know they are! I was so interested recently in a discussion on schedules in puppy raising. On the one side were the practical considerations: puppies have to eat frequently and are messy. Their needs require regular attention, this dictates some type of scheduling. On the other side were some very thoughtful ideas concerning teaching puppies to handle unexpected changes with confidence and the need for unpredictability in puppy raising. Maybe what we need is both predictably and unpredictability? 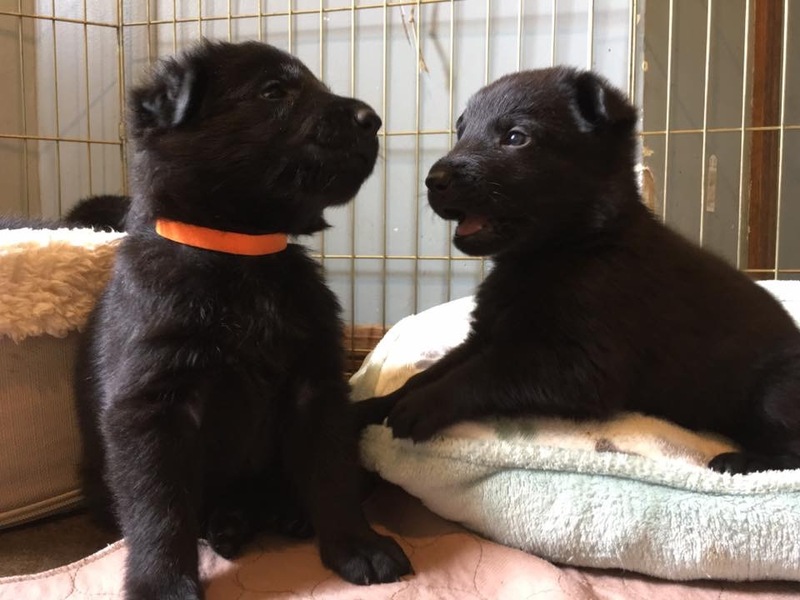 Four week old puppies require scheduled feeding, cleaning, and other necessities. Create a feeling of security with a schedule. Puppies are a schedule intensive creature, by making note of your puppy care schedule you can help both your family and the puppy. Make note of your typical feeding/cleaning schedule (for most breeders this is AM, Midday, PM and for breeders who do crate work, late PM potty breaks) as well as your training and crate conditioning routines. 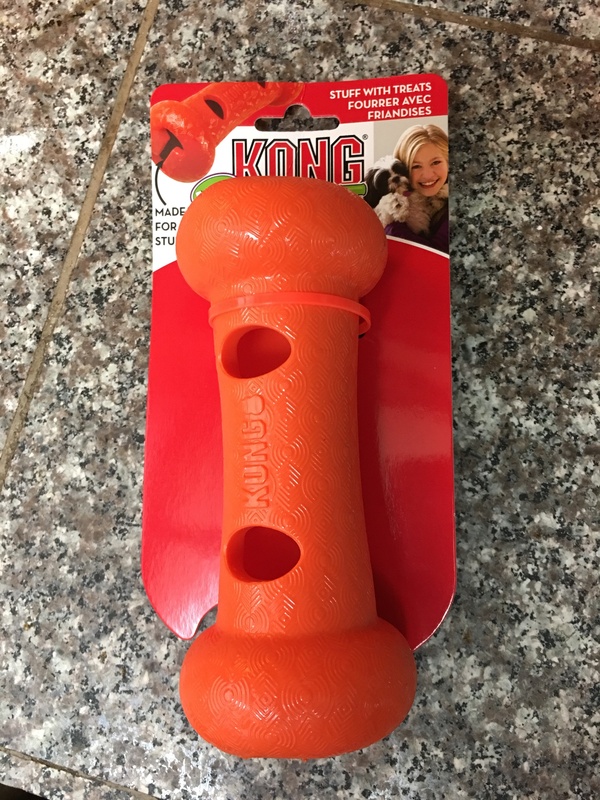 You can easily imagine how this might impact your puppy in it’s new home. 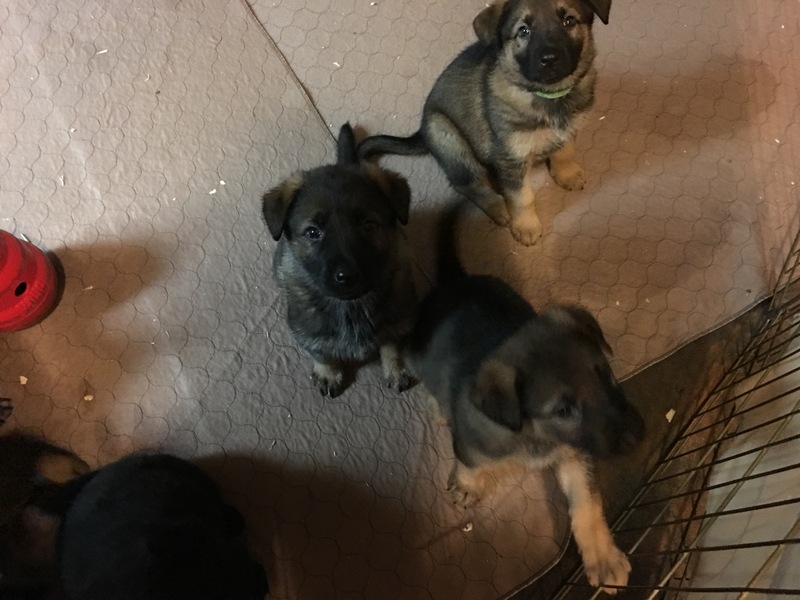 Most puppies will have owners who work during the day and many puppies can expect to be crated for some amount of time at night and during the day until fully house trained. So, we try to work on crate conditioning with our litters during late afternoon. This occurs after morning clean up, meal, and play time, when the puppies are getting tired and ready for rest. At this point we do crate chews and naps. It’s by design that we work on crate conditioning in our morning routine instead of our evening one. 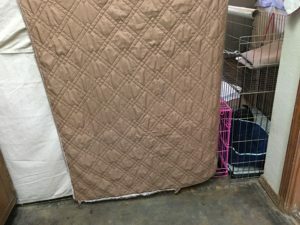 Because most puppies are going to experience crating during the daytime, whether they are companion, show, working, or sport dogs. So during the transition period our routine can help the puppy expect to spend some time during the day crated and napping. Further, knowing this routine can help our family during the transition period. 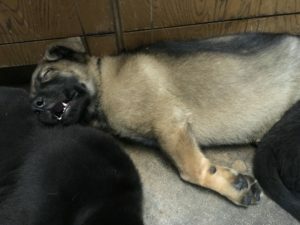 By knowing their new puppy typically naps after breakfast, the new family can schedule a nap time around the same time. Changes due to the families schedule can then be made gradually during the first week. Create adaptability by throwing out the schedule! We don’t want our puppy to be so habituated to a particular schedule that changes in routine are distressing. So while puppies really do require some scheduling of meals and cleanliness for their health and wellbeing, we can also create an happy anticipation of change by pairing random events with very enjoyable activities. Puppies enjoying a noodle around the yard. Creating a joyful anticipation of the unexpected is easy! Mix up your elective activities to create a love of the unexpected. We can’t really just “not feed or clean up after” our puppies, that’s a given. Puppies require regular feeding and a clean environment. But all other activities (passive enrichment, active enrichment, crate conditioning, etc.) are elective activities that we can move around. Further, since our puppies LOVE these elective activities (as they are paired with food, play, and learning) we can also create a happy anticipation of change by creating some randomness in these activities. This is how I do that! I assign each activity a number, some tasks are listed twice because they need repeating more often. 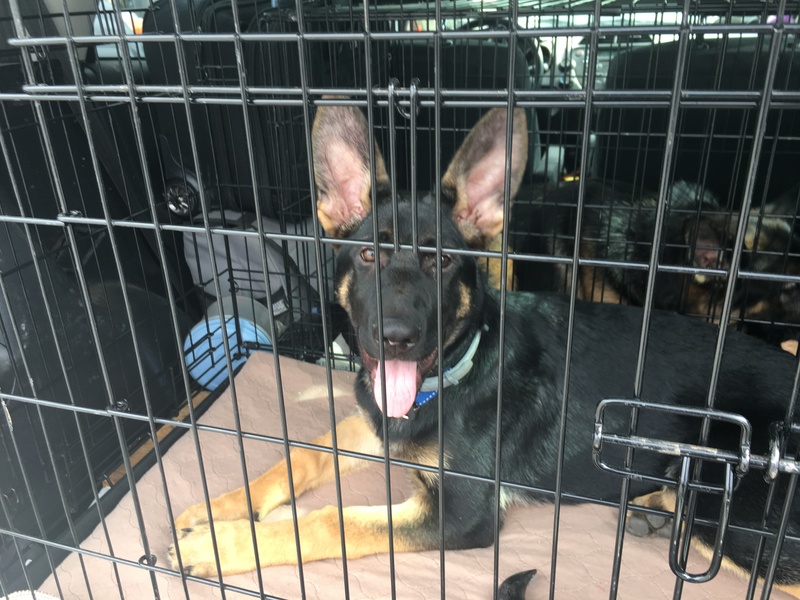 Unexpected crate time in the car! Crates and cars are great because we pair both with wonderful chews and thoughtful conditioning programs. 1. Passive Enrichment: Novel item(s), Pen toy resets. 5. 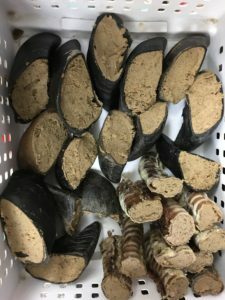 Crate Conditioning: Crate chews, in house or car. 6. Nothing Time: puppies are left alone in the house. 7. Play: Fetch, Flirt, Tug games. 8. Nothing Time: We are home, but not interacting. 10. Active Enrichment: Clicker Training (this is twice, because we have lots of training to do!). Puppy learning to hand target, as part of a random activity. Then I download a free Random Number Generator onto my phone (from the App Store or Google Play) and set it from 1-10. The Random Number Generator then gives me number that matches one of my elective activities. I do this activity during one of three free times, After Breakfast, After Lunch, or After Dinner. Since I know I can’t skip feeding or cleaning up after my puppies, this means I need to work variety in between these non elective scheduled tasks. And of course, sometimes we don’t do anything! This allows me to condition the puppies to both feel confident their needs will be met, and at the same time, that many fun and unexpected things are going to happen in any day. By including both alone at home, and ignored time in our rotation puppies learn to expect being unattended sometimes, even if we are home! Note, I’ve included two types of “alone time” time when we leave the house and another time when we are home but not interacting with the puppies. Both happen as part of our regular schedule, but I want to ensure that the puppies have lots of experience with us leaving the house, as well as us being home but ignoring the them. This mirrors real life. 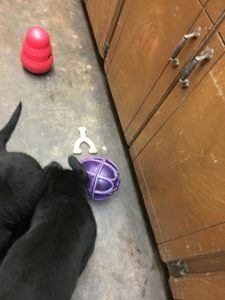 With just a little planning we can teach our puppies from the beginning that their needs will be met predictably, and further, that variations in schedule and unexpected things are wonderful and to be enjoyed! Both are needed to help puppies grow into well adjusted and adaptable adult dogs. Crates are a great management tool for new families, keeping puppy safe and out of trouble, but the new family can’t take advantage of crates and x pens if the puppy panics when placed inside. Rook lounging in his crate, with attached x pen, during his transition week. Because Rook associated confinement with good things, he was easily able to relax when confined in his new home, right from the start. 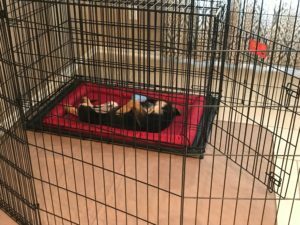 One of the greatest gifts you can give your puppy and it’s future family is investing in creating a Positive Conditioned Emotional Response to being both crated and confined in an x pen. Both are tools your puppy family needs to use to manage their puppy’s behavior in the first hours, days, weeks, and months of it’s life. By taking some time to create a positive association with the crate, the puppy will be better able to self soothe and self calm when confined in a strange environment, because it views the crate as a source of comfort. 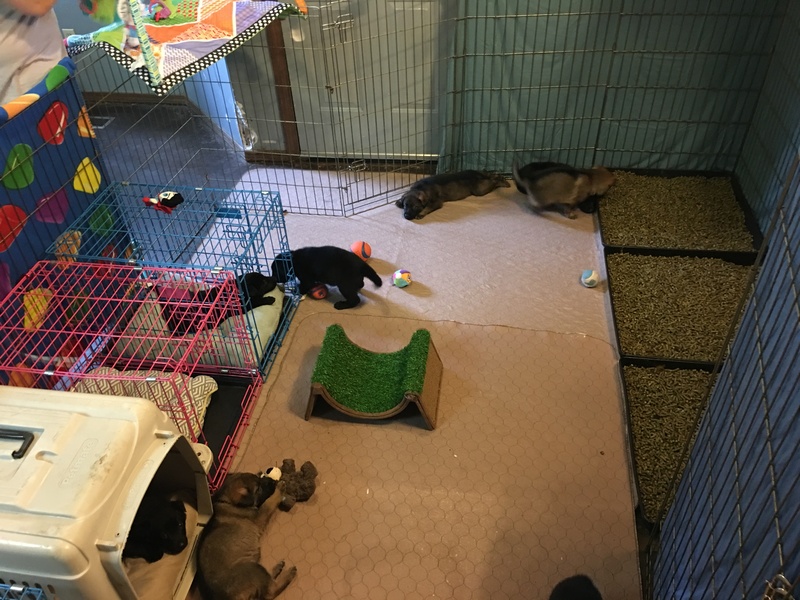 8 week old puppies relaxing during daily crate time, some napping, some chewing, all content. 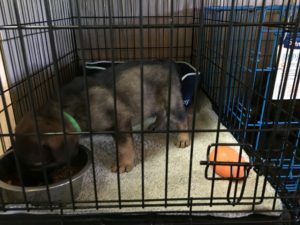 Conversely, if your puppy has had rushed and forced confinement and so has formed at Negative Conditioned Emotional Response to confinement, this may express itself during transition stress as excessive vocalization, panic, refusal to enter the crate, or urinating/defecating when confined. While stress is a necessary part of any transition, distress is not, and can lead to panic and a less than ideal outcome. 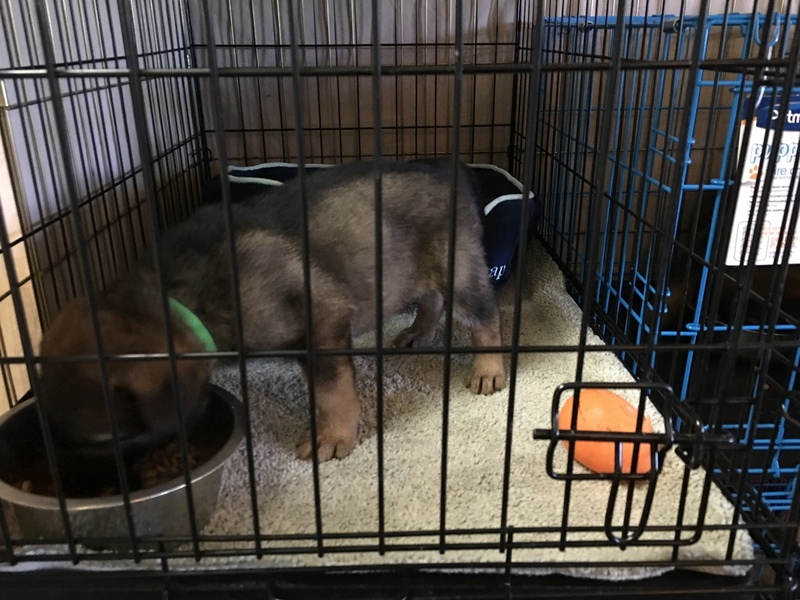 If you want to learn about how we use choice and chews to condition puppies to love confinement read about it here! Crate Conditioning for Puppies: An incremental approach. Easy transitions can be as simple as clear instructions, a familiar item, and recommending the right toys. 1. Clear Written Instructions. This is so easy, and something most breeders do anyway. By providing detailed dietary instructions, at least a week’s supply of the breeder’s diet, and instructions for well tolerated training bait and treats, the breeder can help ensure that the transition time isn’t complicated by unnecessary gastric upset. Your puppy pack is the first line of support for your families during transition week. Ours includes a large bag of puppy food, a can of puppy food, two well tolerated treat suggestions, and detailed written instructions. Puppies experiencing GI upset may not be able to sleep through the night, may soil their crate, or themselves. This can quickly move them from normal transition stress to transition distress not to mention the distress a sick puppy can cause their new family. Set your families up for sucess by guiding them on the importance of dietary consistency in both meals, enrichment, and training bait during transition. Provide a list of foods you know are well tolerated by your puppy. 2. Scented Items and Familiars. Be sure to send a scented item home with each puppy; this can be a baby blanket, fleece toy, or even the puppy’s own crate. By sending scented items home with the puppy, you provide a source of familiarity and comfort during transition. 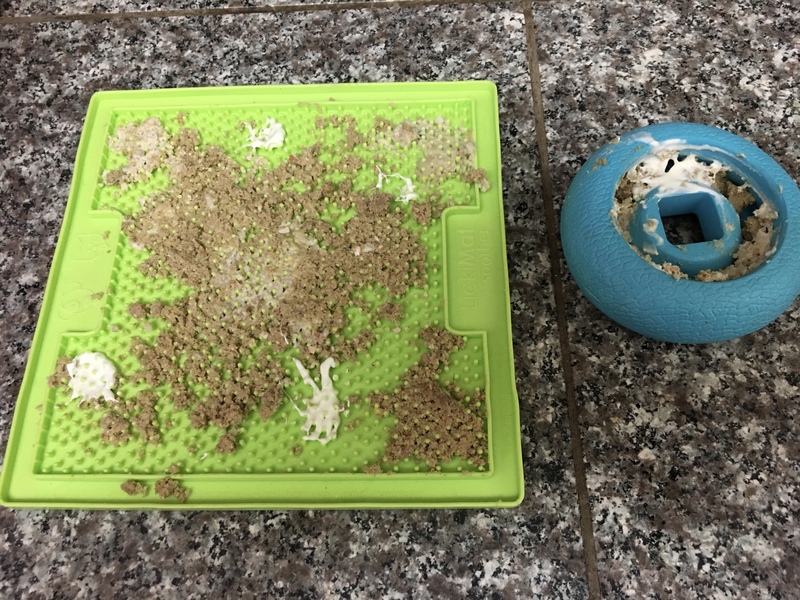 Fleece blankets and toys are great familiars to send home, but something as easy as this rubber back bathroom rug/crate pad work great. A blanket, pad, or rug can be placed right in the car when the puppy goes home. Conversely, one breeder I know asks for a t-shirt, slept in one night by each member of the family, be sent a week before the puppy goes home. 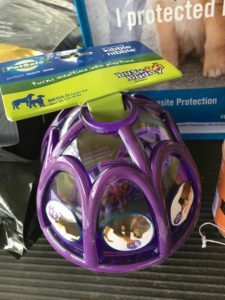 This family scented item is placed in the puppy area, or crate, for that week. This t-shirt is then sent home along with the puppy. What a great breeder! 3. Teach your puppy, and it’s new family, all about pacifiers! Pacifiers and other “brain games” for puppies provide long lasting activities, many of which will reduce stress, help puppies “reset” from stressful and exciting days, and learn to self calm and self soothe easily. Your puppy’s new family will benefit greatly during transition by being able to provide the puppy with a variety of pacifiers. Some of these pacifiers will be instinctively engaging to puppies. Natural chews such as hooves, bones, tracheas, and bully sticks require no “teaching” and puppies will enjoy these stress busting items right from the start. This puppy doesn’t need to learn to chew this patella, this is a naturally stress busting activity. Some pacifiers, such as Kibble Nibbles or Woblers, need practice and puppies need regular exposure to learn to enjoy them. We send a Kibble Nibble home with each puppy. This pacifier takes some practice to master and learn to enjoy. So we start putting these in the litter box when the puppies are 5 weeks old, with adult dogs to demo! 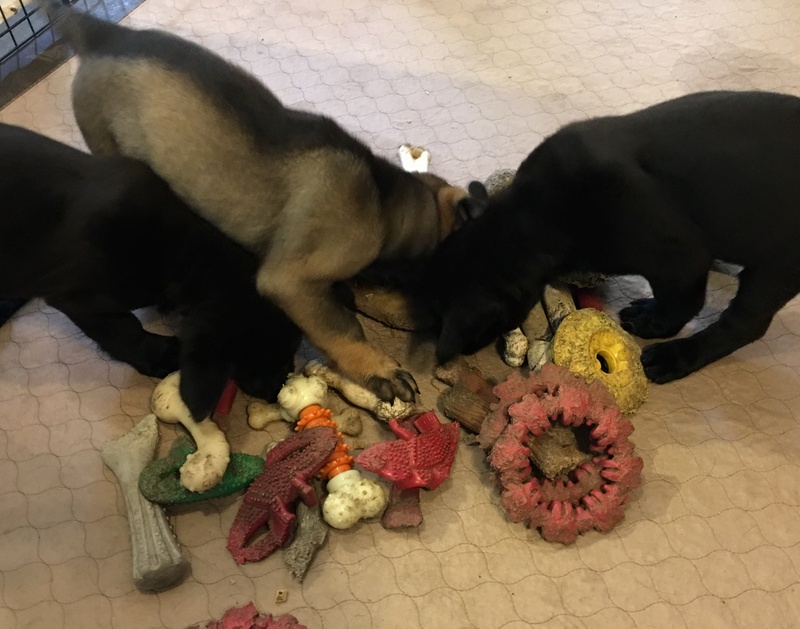 By starting around weaning age and offering different pacifiers throughout the weeks, the puppies have lots of opportunity to learn how to engage with these items and to enjoy them. 7 week old puppies scootering around a Kibble NIbble while a Kong Wobler (already emptied) sits nearby. 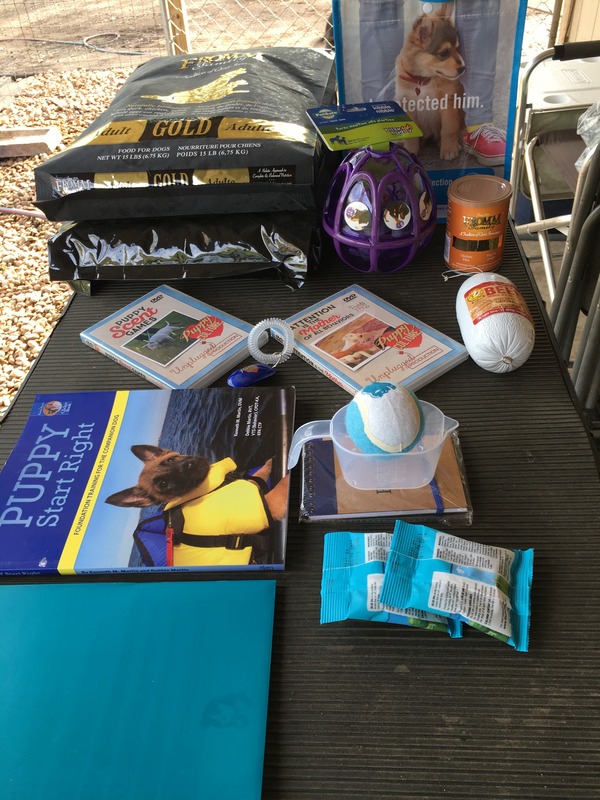 By offering practice with these items early, the puppies learn to love this activity, providing their new family with a great management tool. Here is a list of items we find work well. You can find a great thread of others in the Puppy Culture Discussion Group. 8. Scent Items and Familiars. Give your new family a bully stick, and you amuse their puppy for an hour, teach them to stuff a Kong and they can amuse their dog forever. Take a few moments to teach your clients the benefits of pacifiers, then teach them how to prepare them! Provide resources for Kongs, Squirrel Dudes and where to find recipes. Point them to the great Canine Enrichment Facebook group for more ideas. These familiar activities provide a sense of continuity for your puppy, just as comfortaing as a scented blanket. Good breeders are already doing all these things for their puppies. By thinking forward to our puppy’s transition to it’s new home, by communicating clearly to our clients, and by investing some time in teaching puppies to use pacifiers, we give our new families helpful tools to make the arrival of their new best friends as smooth and pleasant as possible. It seems simple really, something that good breeders are already doing can play such a vital role in helping puppies thrive during transitions. Easing transitions through individual handling by familiar people, positive experiences in novel locations, and positive experiences with novel people. 1. Individual Handling = Attention, Treats, Fun. Puppies as young as two weeks benefit from individual cuddle sessions. 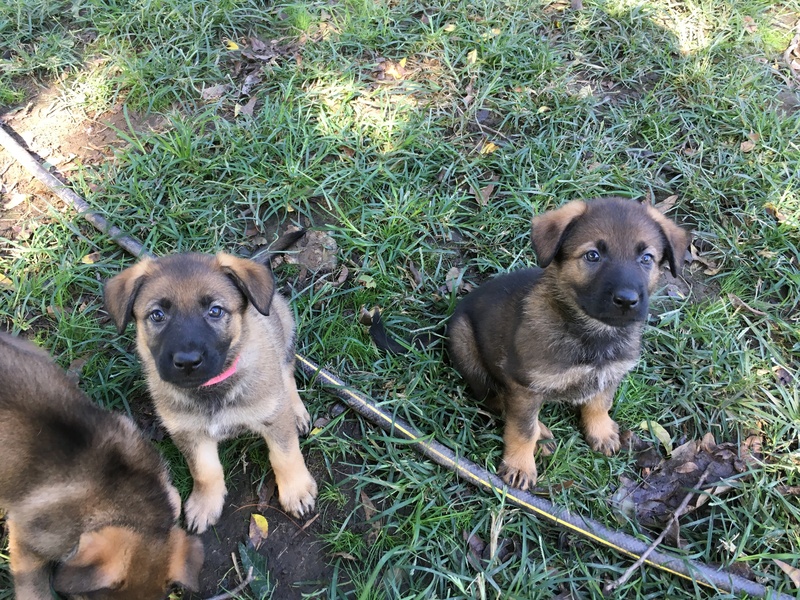 As per the Puppy Culture protocol we follow, as soon as your dam will tolerate it, remove each puppy from the dam and litter for individual attention. Make some time for this each day if possible. Early on, this will be exclusively cuddling, brushing, and other form of petting, but as the puppy matures and becomes socially aware this should expand to include grooming, husbandry, and training, all taught and conditioned with high value food, as well as play. Create a checklist, or use the Puppy Culture Workbook to ensure you rotate through each type of activity with each puppy. 2. Novel Locations= Attention, Treats, Fun. This puppy has been removed from the litter to play in a bedroom, learning early on that removal equals fun! As part of your Individual Handling, be sure to rotate through different locations. It’s tempting, and convenient, to simply remove a puppy and work in the living room, but make an effort to use every puppy safe room of your house, and even carrying a puppy outside to a front or back porch. Older puppies can be taken to your puppy safe yard, or even off property in a puppy stroller. If you are doing car conditioning, this counts as a novel location and individual attention too. 3. Novel People=Attention, Treats, Fun. 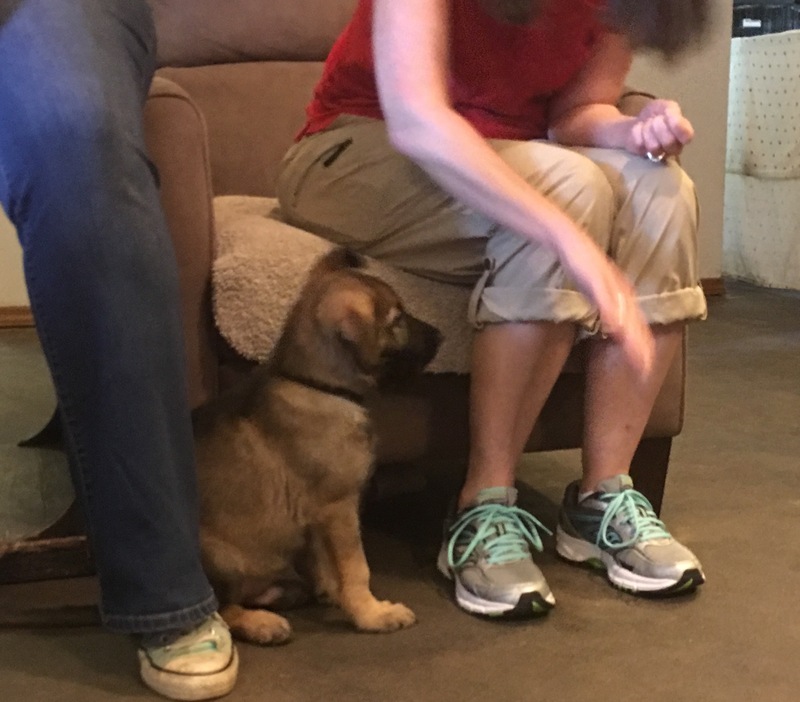 This puppy is meeting my mom for the first time, learning that being removed from the litter and meeting new people is awesome! 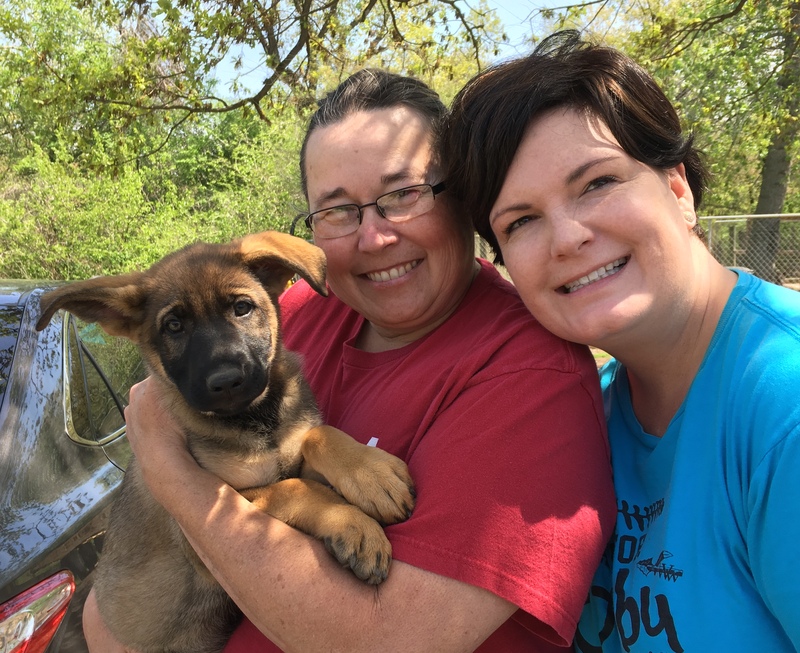 Even though breeders often wait to introduce novel people until puppies are older, most breeders have a small group of family and close friends who drop by to visit puppies (using all appropriate bio hazard protocols). 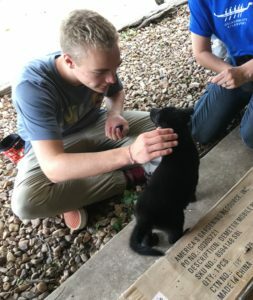 These visits should contain some individual handling of puppies, of course be sure your dam will tolerate this, and use proper management to ensure everyone is comfortable and safe. When your guests arrive, take a few moments to load everyone up with super yummy treats (assuming your puppies are eating and excited about food), give out age appropriate puppy handling instructions, and remove a single puppy from the litter for individual cuddles, treats and if enjoyed by the puppy, training and grooming. Two or three minutes is long enough for these individual sessions. After each puppy has had a turn, the litter can be released for a mass visit. Something as simple as a few moments of individual attention, having fun in novel locations, having fun meeting new people as an individual puppy can have a lasting impression and help your puppies face future transitions with confidence. 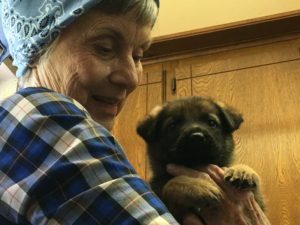 This puppy has learned to anticipate being removed from the litter and interacting with strangers as a positive experience—an association that traveled with her to her new home. *NOTE! Always supervise, manage, and control each socialization exposure of each puppy. Remember, Single Event Learning is real and any scary or traumatic experience during the CSP can have long lasting effects on the puppy’s behavior. 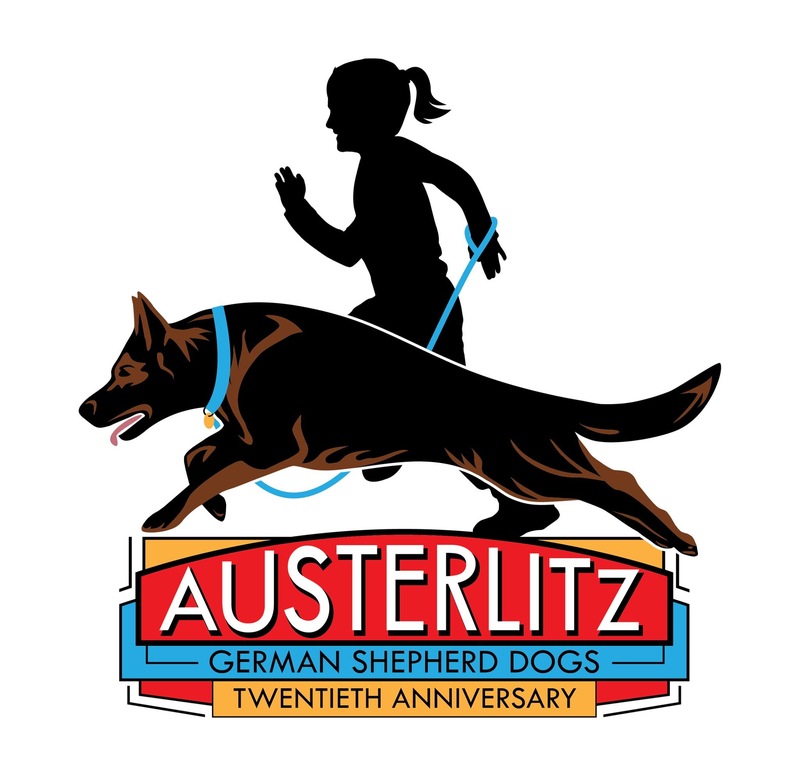 Do you best to use Single Event Learning to the advantage, not detriment, of your puppies. Visit any Facebook group on dog care or training and you’ll find lots of questions from new puppy families. Many of these questions and concerns stem from, or are caused by, transition stress. Stress is often defined as a state of mental or emotional strain or tension resulting from adverse or very demanding circumstances. In our case, the stress is the transition from the breeder’s home to the home of the new family. Coping with this transition should always fall under “demanding” and never “adverse” experiences, as our puppies are moving into loving and attentive homes that are carefully chosen to be just the right match for our puppy and the family. It’s important to note that stress is beneficial for our puppy. All dogs will experience multiple stress inducing events throughout life. Indeed many dogs, such as show, sport, or working dogs, will be exposed regularly to stress and their body and mind must learn to cope and function optimally under it’s effects. In short, stress builds stronger and more resilient dogs. Learning to cope with, and work through, stress associated with changes stems from a puppy feeling competent and confident during transitions and is an important part of the socialization experience for every dog. Our work starts long before this day! By thinking about the imminent departure of our puppy and preparing the puppy for this experience, we can help our puppy adapt as easily as possible during this transition. We can also teach our family how to help their dog master transitions, something that sets both puppy and family up for long term success. 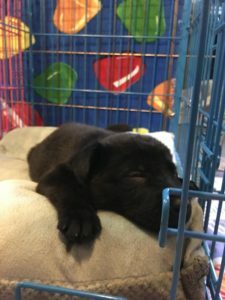 I’ve compiled a list of 10 easy to implement exercises we use to help puppies transition smoothly to their new homes. These are based heavily on the Puppy Culture protocols we are already using. 1. Puppy will learn to anticipate transitions as positive experiences that lead to good things. 2. 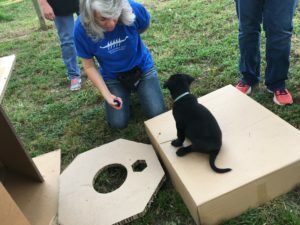 Family will learn how to teach their puppy that transitions are positive experiences using primary reinforcements such as: Social Interaction, Food, Play. 3. Family will learn to make the most of management and choice funnels to set their puppy up for success and growing confidence in choice. Individual cuddle and attention starts early. 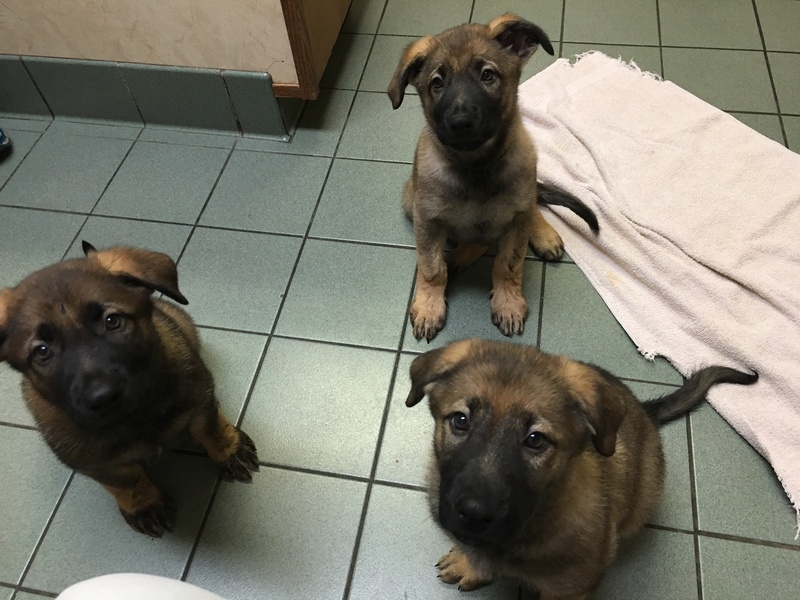 As per the Puppy Culture protocol we follow, as soon as your dam will tolerate it, remove each puppy from the dam and litter for individual attention. Make some time for this each day if possible. 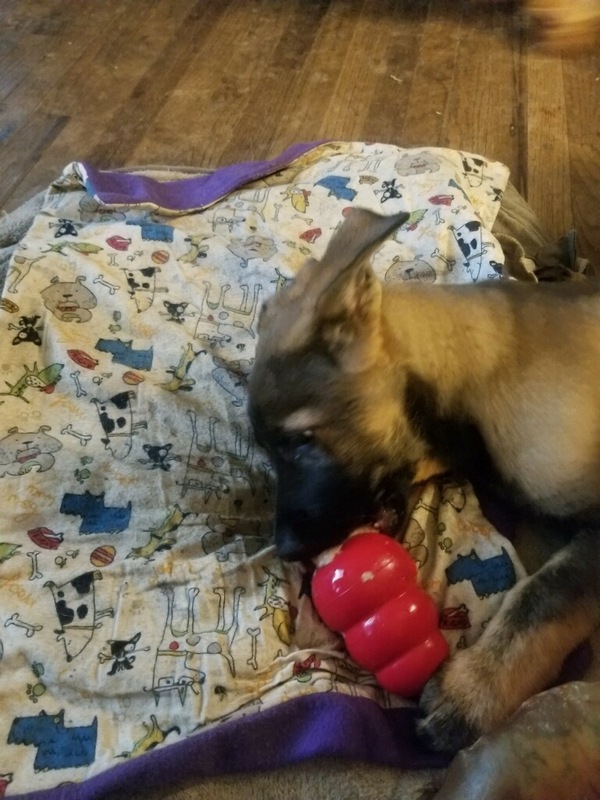 Early on, this will be exclusively cuddling, brushing, and other form of petting, but as the puppy matures and becomes socially aware this should expand to include grooming, husbandry, and training, all taught and conditioned with high value food, as well as various types of play. Create a checklist, or use the Puppy Culture Workbook to ensure you rotate through each type of activity with each puppy. Try to avoid only removing puppies for things the puppy might experience as unpleasant, such as vaccinations, worming, or other necessary care. Our goal is our puppy learning to associate removal from it’s litter with positive experiences. New room, new bed = Play! 2. Novel Locations = Attention, Treats, Fun. As part of your Individual Handling, be sure to rotate through different locations. 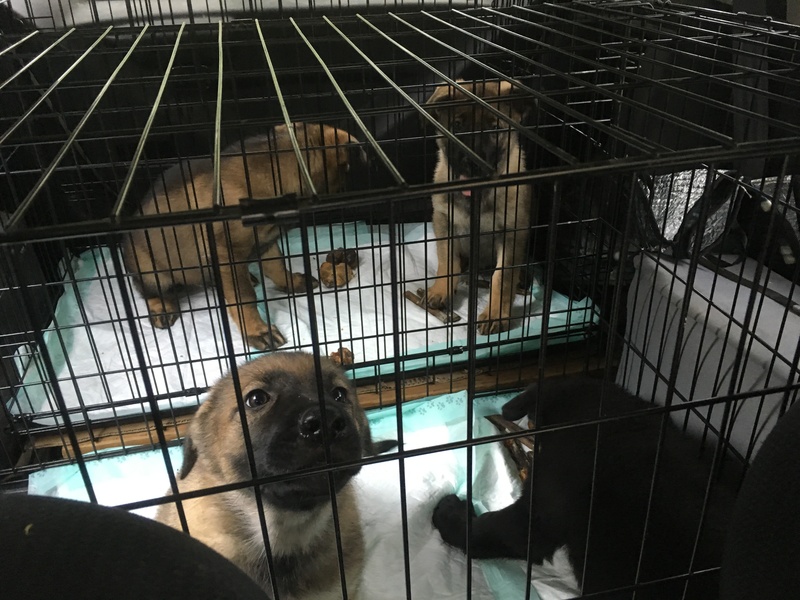 It’s tempting to simply remove a puppy and work in the living room, but make an effort to use every puppy safe room of your house, and even carrying a puppy outside to a front or back porch. Older puppies can be taken to your puppy safe yard, or even off property in a puppy stroller. If you are doing car conditioning, this counts as a novel location and individual attention too. On a hot summer morning Caleigh learns that interacting with a stranger (her future mom Camille) is both safe and fun. Even though breeders often wait to introduce novel people until puppies are older, most breeders have a small group of family and close friends who drop by to visit puppies (using all appropriate bio hazard protocols.) These visits should contain some individual handling of puppies (of course, be sure your dam will tolerate this) and use proper management and safety protocols to ensure everyone is comfortable and safe. Once puppies are in the Critical Socialization Period, visits increase. Emphasis should be placed on creating and maintaining a Positive Emotional Response or Positive Conditioned Emotional Response to people and locations. This puppy has already learned how to offer eye contact as a behavior, so she is delighted to learn that this new person will also click and treat her for offering eye contact. She now feels very confident and has happy associations with being removed from her litter and handed off to a person she does not know.s as well as transitions. Make abundant use of high value food and chews and all positively taught behaviors the puppies know. *NOTE! Always supervise and manage socialization of your puppies. 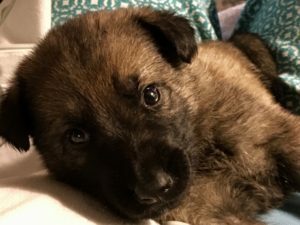 Remember, Single Event Learning is real and any scary or traumatic experience during the CSP can have long lasting effects on the puppy’s behavior. 4. Create Security in Schedules. Portia is enjoying crate resting time after morning exercise and training. She has two pacifiers, and is already conditioned to expect resting during the late morning. This will help her feel more confident when crated in her new home. Puppies are a schedule intensive creature. By making note of your puppy care schedule, you can help both your new family and the puppy. Make note of your typical feeding/cleaning schedule as well as your training and crate conditioning routines. 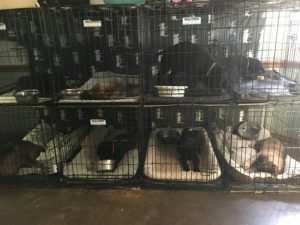 Most puppies will have owners who work during the day and many puppies can expect to be confined at some point during the day, and crated during sleeping hours. Knowing this, we try to work on crate conditioning with our litters during the day. This is fit in after morning clean up, breakfast, and play time, when the puppies are getting tired and ready for rest. 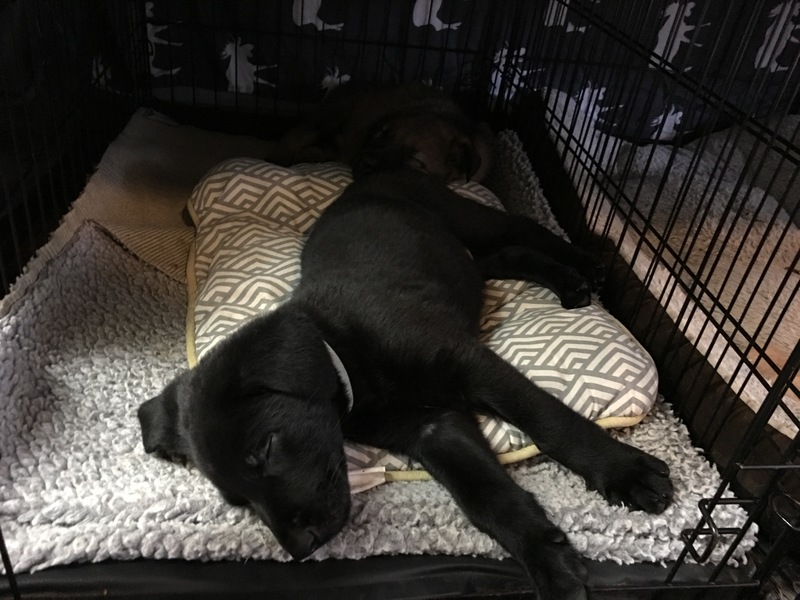 At this point we do crate chews and naps, as the puppies are primed and set up for success – napping and being calm in their crates. By anticipating what your puppy’s schedule will likely be in the new home, you can prepare your puppy for it’s transition. Knowing what to expect builds a puppy’s confidence during the stress of transition. Further, knowing this routine can help our family during the transition period, so be sure to send home a copy of your schedule with each puppy. Surprise Car Crate = Raw Bone! 5. Create Adaptability By Throwing Out The Schedule! We don’t want our puppy to be so habituated to a particular schedule that changes in routine are distressing. So while puppies really do require some scheduling of meals and cleanliness for their health and well being, we can also create an happy anticipation of change by pairing random events with very enjoyable activities. Mix up your elective activities. We can’t really just “not feed or clean up after” our puppies, that’s a given. Puppies require regular feeding and a clean environment. But all other activities (passive enrichment, active enrichment, crate conditioning, etc.) are elective activities that we can move around. 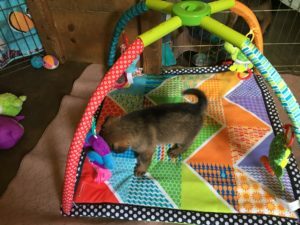 Since our puppies LOVE these elective activities (as they are paired with food, play, and learning) we can also create an happy anticipation of change by creating some randomness in these activities. This is how I do this! I assign each activity a number. 1. Passive Enrichment: Novel item(s), Weaning Pen toy resets. 2. Active Enrichment: Clicker training lessons. 3. Puppy Scent Games: Puppy tracking. 4. Noodling: Yard exploration and play. 9. Grooming: Individual, one-on-one attention. The Random Number Generator then gives me an elective activity, and I do this activity during one of three free times: After Breakfast, After Lunch, or After Dinner. Since I know I can’t skip feeding or cleaning up after my puppies, this means I need to work variety in between these non elective scheduled tasks. This allows me to condition the puppies to both feel confident their needs will be met. But at the same time, that many fun and unexpected things are going to happen in any day. Note, I’ve included two types of “alone time” time, one when we leave the house and another when we are home but not interacting with the puppies. Both happen as part of our regular schedule, but I want to ensure that the puppies have lots of experience with us leaving the house, as well as us being home but ignoring the them. This mirrors real life and what will happen in any type of home situation. 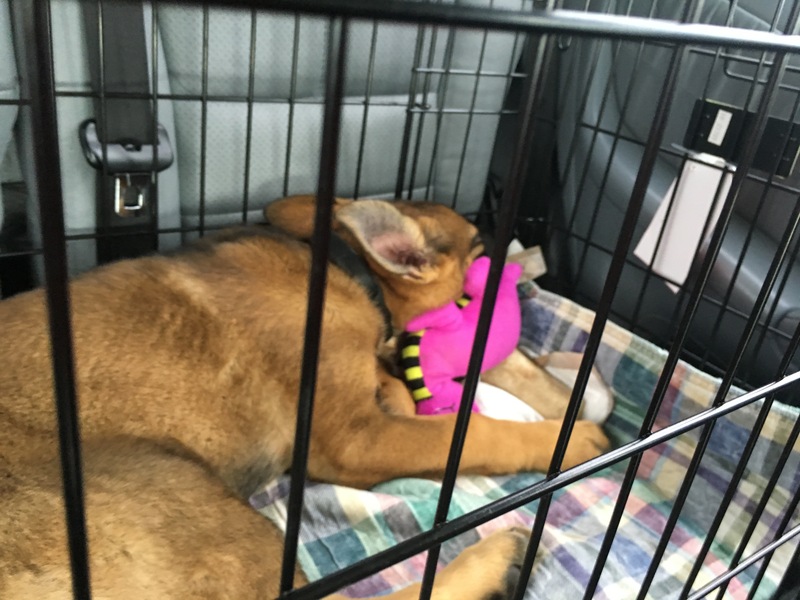 One of the greatest gifts you can give your puppy and it’s future family is investing in creating a Positive Conditioned Emotional Response to being both crated and confined in an x pen. Both are tools your puppy family needs to use to manage their puppy’s behavior and safety in the first months of it’s life, and both are a common cause of distress for puppies and owners. 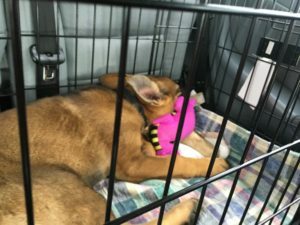 Conversely, if your puppy has had rushed and forced confinement, and thus has a Negative Conditioned Emotional Response to confinement, this may express itself during transition stress as excessive vocalization, panic, refusal to enter the crate, or urinating/defecating when confined. All these signs of distress can affect outcomes in the new home and even the dog’s behavior going forward. Puppies chasing a Kibble Nibble. 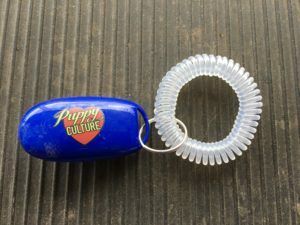 Your puppy’s new family will benefit greatly by being able to provide the puppy with a variety of pacifiers, but only if puppies leave the breeder knowing the behaviors needed to enjoy pacifiers this will be much easier. Again, when presented with a familiar challenge in the new home, a puppy’s feeling of competence during transition increases. Some of these pacifiers will be instinctively engaging to puppies. 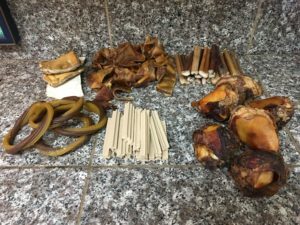 Natural chews such as hooves, bones, tracheas, and bully sticks require no “teaching” and puppies will enjoy them right from the start. Some pacifiers, such as Kibble Nibbles or Wobblers, need practice and puppies need regular exposure to learn to enjoy them. Here is a list of items we find work well for our puppies. Be sure to send a scented item home with each puppy; this can be a baby blanket, fleece toy, or even the puppy’s own crate. By planning to send scented items home with the puppy, you provide a source of familiarity and comfort during transition. I love these hand crafted blanket and tug kits from Smiling Dog. Conversely, you can send home a snuffle mat, which doubles as an enrichment item and a familiar. 9. Send home detailed dietary instructions. This is an easy one, and something most breeders do anyway. 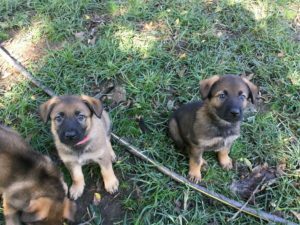 By providing detailed dietary instructions, at least a weeks supply of the breeder’s diet, and instructions for training bait and treats, the breeder can help ensure that the transition time isn’t complicated by unnecessary gastric upset. Puppies with GI upset may not sleep through the night, they may soil their crate or themselves, and all these things can push a puppy from transition stress into transition distress. Set your families up for success by guiding them on the importance of dietary consistency in both meals, enrichment, and training bait during transition. This puppy has learned to target her nose to the hand. Her new mom learns how to maintain and use this very functional behavior before taking her home. This helps them have a mutually understood “language” during transition. 10. Install positively conditioned bridges to help your puppy “over” life’s transitions. I’ve saved the most important for last. Really, this subject warranted it’s own lengthy blog (but don’t worry, I’ll save that for another day!) because it’s really just THAT important. What do we mean by a bridge behavior? A bridge is a behavior taught in such a way that a positive emotional response is PART of the behavior. A bridge doesn’t work if it’s a behavior the puppy learned through avoidance. We want our bridge behaviors to help us reach our goal of a dog who thrives under stress, and who enjoys life’s transitions. The magic of the bridge is in the communication between the puppy and the new owner. 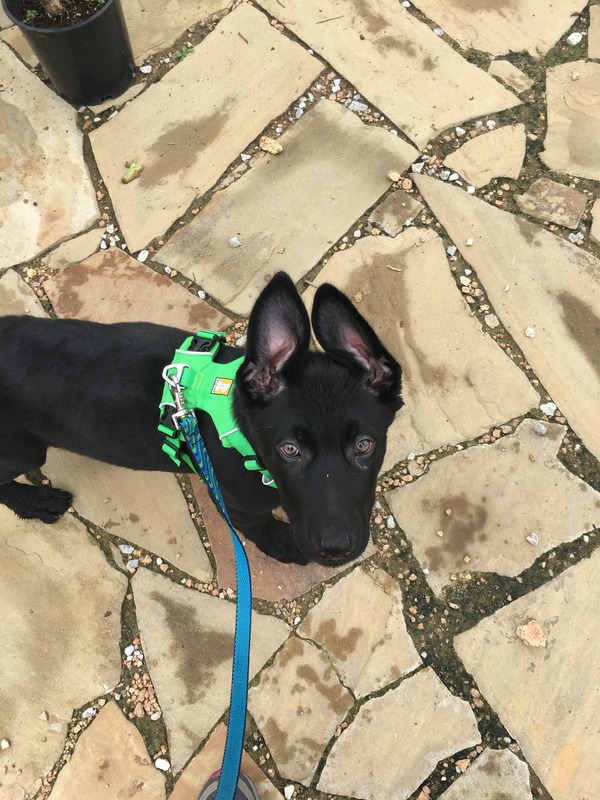 When puppies leave our home they also leave behind all those contextual cues and paths to access reinforcements that help them know what is expected when, and what behavior might work in particular settings. They feel a bit like “strangers in a strange land” in the new home. 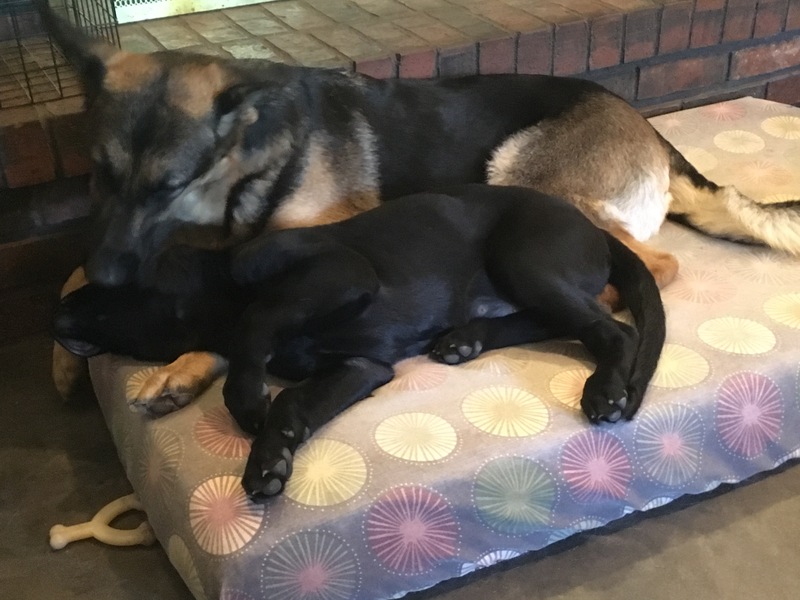 The new family often feels the same way, just how do they get the puppy to do the things they need? Our bridge behaviors give the puppy a way to communicate to the owner, and the owner to the puppy. There is empowerment, confidence, and mutual bonding in this shared language. We encourage our new families to start the day they bring their puppy home with the Puppy Culture Communication Trinity, and to run through these lessons in order. 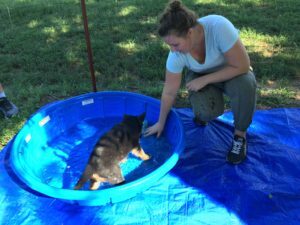 Running through these familiar lessons helps the puppy feel confident and competent in the new home. Our bridge behaviors MUST include a positive emotional response. 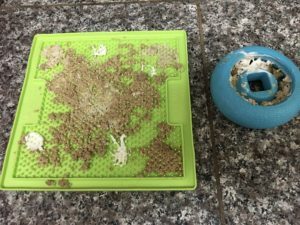 Since we are Puppy Culture breeders and clicker trainers, this is easy for us, as all our Puppy Culture Active Enrichment Behaviors and our other clicker trained behaviors fit this requirement. With this small set of baby behaviors our puppy can, when unsure what to do, be quickly prompted for behaviors they are confident in and have a positive emotional response to. Attention is a powerful bridge behavior and easy to recognize reinforced throughout the day. Of course, we also need to teach our new families the basics clicker training, and most importantly when and how to use the bridge behaviors. Puppy can run outside the door to “find it”. 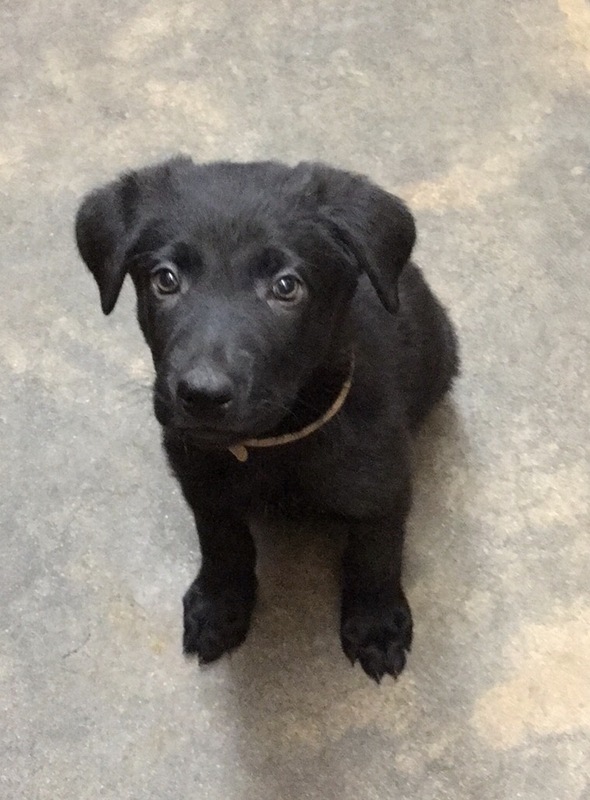 Puppy can Come for meals, attention, and play. 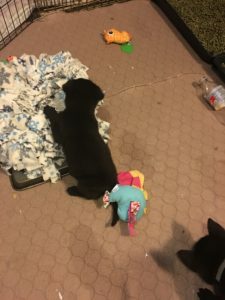 Because we have already conditioned these bridge behaviors, AND taught the puppy owner how to teach, use, and reinforce them, the puppy can experience these situations (all of which are transitions) as fun and reinforcing events because the puppy “knows” how to earn reinforcement in the form of praise, food, and play. What a great confidence booster! 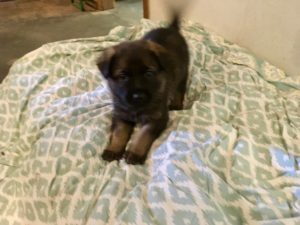 Will our puppy still experience stress during it’s transition? Of course our puppy is still going to experience transition stress, and this stress is beneficial. But by planning ahead we can create a confident puppy who transitions easily, one who welcomes change, variety, and thinks clearly under stress. We also provide our new puppy families with the knowledge and skills they need to have the smoothest transition possible. After all, puppies are TONS of hard work, as breeders we can lighten this workload on our new families tremendously, just through planning and execution of some good common sense protocols. Modern dogs face many challenges and stressors that our breed’s foundation dogs and our breed architects couldn’t imagine. Modern breeders are not only producing dogs who can adapt to modern environments, but we are also doing our best to give puppies the tools they need to succeed, from the couch to the podium, right from the start.